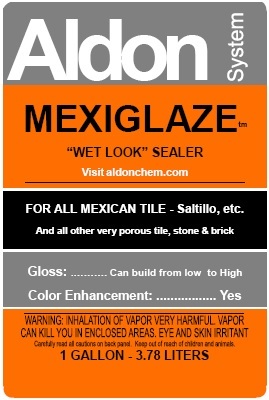 Mexiglaze Sealer by Aldon. For stone, brick, slate, all highly absorbent surfaces. Product: "Mexiglaze Stone & Tile Sealer"
In the same formula family as S-B-S Sealer, Penetrating Paver Sealer, & Porous Stone Sealer. Higher solids level than S-B-S Sealer and Porous Stone Sealer. Designed to use fewer gallons (less final cost) on highly absorbent surfaces than a lower solids sealer. Examples are the highly absorbent sandstones (flagstones), Mexican Tile, regular brick, etc.. Creates the rich colors and gloss called the "Wet Look". Highly penetrating, acrylic in a non-flammable solvent base. Creates noticable enhancement of the surface's natural colors. Allows gloss buildup that is customizable with additional applications. Allows gloss reduction (if higher than desired) by using lacquer thinner to dissolve solids for further penetration into the surface (or removal with a clean, white cloth). In the past tung oil, linseed oil, motor oil, and waxes have been used for Mexican tile. The oil "fills" the porosity of the tile so a coating of wax can float on top. This creates a soft and very pleasant finish, however, there are considerable negatives to this process. It does not strengthen the body of a soft Mexican tile - it can create color problems if a quality sealer is desired later - the wax is a high maintenance coating. Mexiglaze does not have these issues. Question? Are you in a part of the world with very strict air quality regulations (i.e. parts of California, China, etc.) with restrictions about usage of some petroleum or oil based solvents. Then you need a product to meet those rules. Please review and order "4 in 1 Sealer Concentrate" to meet those needs. It is easily diluted and used on every surface type. And it can also save you money by adjusting the dilution to exactly what you want for the widely varying absorption rates that exist even within the same surface type.
. It penetrates into any absorbent surface - self-levels to a smooth, even low gloss finish - and bonds below the surface so there cannot be peeling. Designed for the very highly absorbent materials like Mexican Saltillo Tile, soft sandstones, flagstones, etc.
. The label instructions provide you with a much easier and more surprise proof application method with fewer applications than you may have seen with other companies products.
. Moves with the 24 hour cycles of sun exposure expansion and contraction without losing bond.
. Extreme damage repair (burn, gouge, etc.) is easy because damaged area is removed with lacquer thinner and reapplication of "Mexiglaze" melts and bonds with the surrounding area.
. Not flammable. Almost all other competing sealers are flammable, and that is a concern.
. "Mexiglaze" is used by DIY and professional installers.
. You are a contractor or Do It Yourselfer who realizes that choosing "Mexiglaze Sealer" is the best and least expensive choice when you are sealing a very absorbent surface. Especially if it is a relatively soft material that could be subject to erosion over time.
. You want the many benefits of a petroleum solvent type sealer, but safer than is generally available. Mexiglaze Sealer is not flammable. Traffic Wear? Any time you create gloss with a sealer, it is subject to traffic wear. You can prevent this with the "sacrificial" wear taking top coating: "Lifeguard". Your results may vary somewhat from the web site pictures due to variations in computer display and the surface materials themselves. Nevertheless, you will be able to see the differences well enough to make good choices. Important: If your project has had any sealer applied in the past, it must be evaluated differently. You will see a simple, logical discussion of the considerations here that can save you time, money, and aggravation. Do not apply a sealer before grouting (pre-sealing). The iron oxide pigments used in concrete products, and the colored clays in clay products, do not fade . The appearance of fading is actually from tiny efflorescence particles (white powder) in the pores. It can be removed and color restored (with Aldon Efflorescence Treatment) and then stopped from returning, and color restored, by sealing with the appropriate Aldon color enhancing type sealer. After the surface is completely dry and looks good, you can stop the efflorescence from returning with the appropriate Aldon sealer that creates a sub-surface barrier. Many times "Lifeguard" is all you need to restore a sealed surface. Test that first if your sealer is only dulled down. And use Lifeguard for future protection of a restored sealer surface.